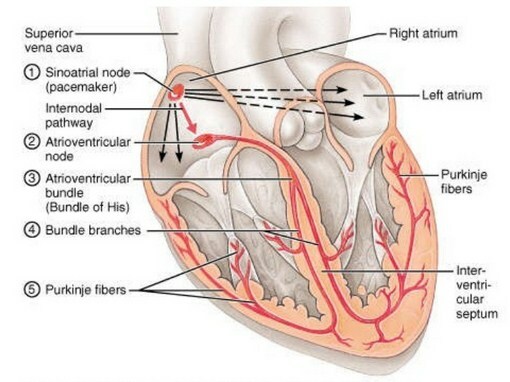 Cardiac impulses are self generated from the pacemaker present in the sinoatrial node. It is situated at the junction between superior venacava and right atrium. The histology of the pacemaker tissue shows, that the cells are spindle shaped, primitive in nature, and different from the surrounding muscle. The cells are called P cells and are rich in glycogen. The resting membrane potential is lower than the other regions of the myocardium. It is around – 60 mv and there is decreased K+exit, causing spontaneous depolarization. The Ca++ transient channels open and lower the membrane potential from – 60 mv to – 40 mv. This slope in the potential is called the prepotential and at this level, the threshold level of firing is usually attained. The long lasting Ca++ channels open and give rise to the upstroke, causing the membrane potential to reach +20 mv. This is the action potential or the impulse. The repolarization begins after the calcium channels close. The potassium channels open (rectifier K+ channels) and repolarization occurs. In this way, the cardiac impulse originates on its own from the pacemaker. The extrinsic autonomic nerve stimulation can modify the rate of firing of the pacemaker. From the pacemaker, the excitation spreads through a specialized conducting system of the heart. meguini.org . Where to print Stickers in Vancouver?